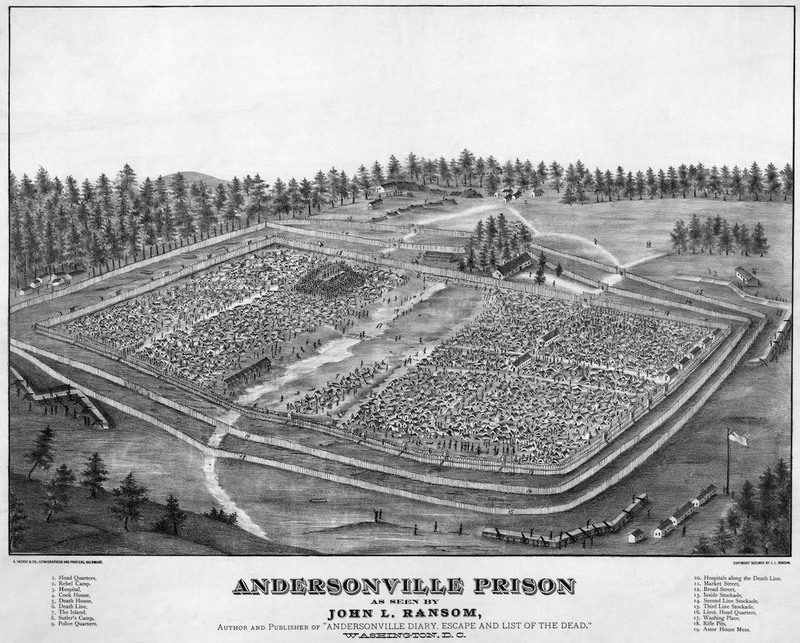 Andersonville Prison was opened in February 1864, 26.5 Georgian acres (about 0.1 square kilometers, or about the size of a square 4 city blocks on a side) of tightly-packed tents with a ditch of water flowing through its center. Its design population was 10-15,000 prisoners; its true population at one point was almost 30,000. ** Some 45,000 Union soldiers went in, passing first the outer stockade, then the so-called “dead line” that demarcated the line outside of which they could be shot summarily, and finally into a mass of malnourished, often sickly humanity. Of these, 13,000 never emerged. The Confederacy, you may recall, was not the war’s winner. As an aspiring nation, the CSA borrowed heavily to fund its arms, then found itself strapped for basic supplies as the war dragged on. By 1863 the nation was already economically depressed, and when a CSA-USA prisoner exchange agreement broke down, the Confederacy found itself with a lot of Union soldiers to house and nowhere to put them. Enter Andersonville: far enough from the North to be “safe”, easily defensible, and in the heart of slave labor to build it. All the Confederacy needed to build some basic housing was wood, which should be … oh wait … war update!…the Union controlled lumber supplies. Guess there won’t be housing. Prisoners instead got lumped in with their brigade, and (at least initially) basic materials to make some sort of shelter.† New arrivals often showed up without being thoroughly checked over, so they might come in with food and supplies that weren’t already available to other internees.‡ Very quickly, the grounds were littered with Union POWs from around the country, people with vastly different backgrounds and goods. As the camp’s population breached 10,000 and then 20,000,§ there were, of course, inmates with designs on better living. It’s not hard to see where this is going. Sometime around May 1864, dozens of them assembled into a loose affiliation. The Raiders were headed by about a half dozen men: Charles Curtis, Patrick Delaney, John Sarsfield, William Collins (“Moseby”), a guy known only as “A. Munn”, and W.R. Rickson (or possibly Terry Sullivan; there’s an unusual disparity in diary accounts on the person’s name, but first-hand diary entries from the moment prefer Rickson) were considered the principal offenders. Each headed a small band of thieves who would trick new entrants, burgle tents, or use violence or threats of violence to amass “wealth” and keep themselves well-fed, well-clothed, and, most importantly to them in this hostile place, alive. The victims were soldiers who, even if they weren’t killed, were left without resources in a deadly environment. Even the robberies and beatings were, in many cases, a prolonged form of murder, and Union inmates knew it. Indeed, Collins was thought by most to have never directly assaulted anyone, but he was known to steal blankets from the ill.
It’s unclear what the full Raider population was (estimates range from 100 to 500, but most people settle on the 100-200 range). What we can say definitively is that it was large enough to be a problem. Late in June of that year, a group called “the regulators” began taking police-like action against the perpetrators. Inmates brought their complaints to the group, which sought out and punished — usually through head shaving or other non-destructive means — those they found responsible. The Regulators, headed by a man called “Lumber” (or maybe “Limber”) Jim, quickly had 80-100 inmates to deal with. Jury trials were implemented in the spirit of (but without most of the protections of) common law, and most punishments ranged from setting in the stocks to running the gauntlet. 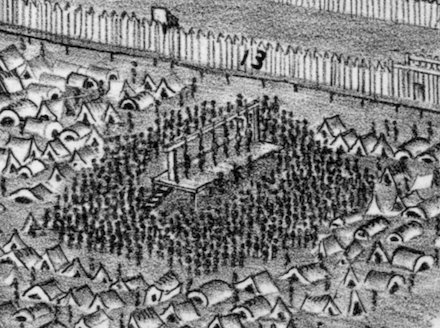 Detail of a panorama sketch of Andersonville (click to see it) makes space for a certain well-attended sextuple hanging. The ringleaders were also among this bunch. 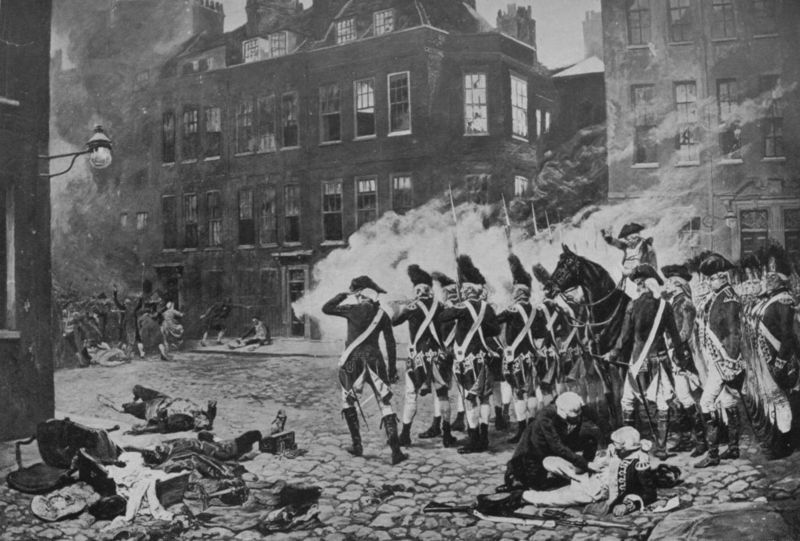 They were assembled on July 11 and executed at a hastily-erected gallows on the north end of camp. As far as the POWs were concerned, the ultimate crime of the Raiders was a violation of the soldier code of death before dishonor. 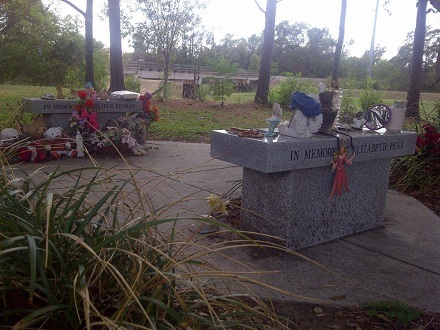 Their bodies were buried separately from other inmates, and the US makes a point of placing no memorial flags at their graves. To be clear, the Andersonville Raiders were, for most inmates, not the primary problem but an obviously controllable one. Remember that 30% of the interned died, and for the most part those deaths were borne of bad sanitation, hunger, and disease. The removal of the Raiders was a morale boost at best, as Andersonville was still a pee-pee soaked heckhole in which another 10,000 soldiers would die before liberation in May 1865, most of them before the summer’s end. * It was also known as Camp Sumter, named after the county it resided in. ** The population density at peak was 330,000 people per square kilometer. For comparison, the world’s densest city is Manila, at about 71,000 people per square kilometer. † It turns out the term “shebang” wasn’t widely-used camp lingo. Drawings and photos of the camp illustrate the variety of dwellings: open sleeping, simple V-tents, structured tents, lean-tos, huts, and shacks were all scattered about the grounds. ‡ They also came with new diseases. § The original camp was actually only 16.5 acres, and the population ballooned to 20,000 in early June and 33,000 in August of that year. Ransom notes that the stockade was “enlarged” on July 6. Fall transfers dropped the number to 1,500 and it bumped back up to 5,000 until war’s end. Sanitation issues persisted throughout. Konrad Vorlauf, late the mayor of Vienna, was beheaded on this date in 1408 with two other councillors. 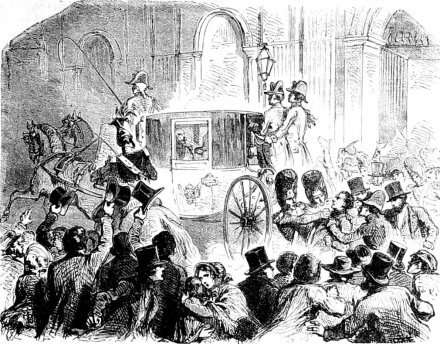 The patrician Burgermeister was a casualty of the dynastic civil war between brothers Leopold IV and Ernest the Iron, which manifested in Vienna — a rising city on the brink of becoming (in 1440) the Habsburgs’ permanent residence — as a conflict between the city’s merchant oligarchs (allied to Ernest) and her artisan craftsmen (allied to Leopold). During a subsequent truce, Vorlauf along with fellow Vienna grandees Hans Rock, Rudolf Angerfelder, Stephan Poll, Friedrich von Dorffen, Wolfhardt Schebnitzer, Niklas Untermhimmel and Niklas Flusthart went to a confabulation called by Leopold under his safe conduct, only to be seized on their return by knights allied to his cause and held to ransom. I have hitherto been a precursor to all others, and I have not earned the death penalty, but I have stood always for the natural rights of my prince. Therefore I offer to my fellows my own example, not to fear a righteous death, but to submit to it voluntarily. 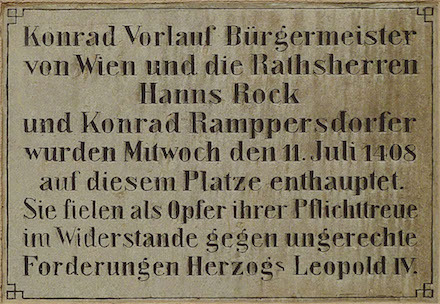 With the childless death of Leopold a few years later Ernest became the uncontested chief of the Leopoldian line, and his martyred Viennese compatriots celebrated as municipal patriots — eventually exhumed from their graves and reburied with honor in St. Stephen’s Cathedral. They were fortuitously allied, as events would transpire, to the imperial glory conquered by Ernest’s descendants in what became the chief Habsburg dynastic line (the mighty Maximilian I was Ernest’s grandson). Today, the place of the mayor’s execution is called Lobkowitzplatz; it’s marked by a plaque paying tribute to the men who bled there in 1408. Commemorative plaque honoring Vorlauf and the others beheaded with him. On this date in 1952, 58-year-old Chester Gregg nonchalantly died in Ohio’s electric chair for killing his wife the previous year. Gregg shotgunned Alma Colliday Gregg, his estranged spouse and the head of the “lonely hearts” club through which the pair oiginally met, in her Kenton apartment after she filed for divorce. As that killing made him a two-timer — he’d been paroled from a 1927 murder rap in Kentucky; the daughter of that victim petitioned unsuccessfully to attend Gregg’s execution — his clemency prospects were remote. Although he’s of no known relationship to the namesake of the landmark Gregg decision returning death penalty to the U.S. in 1976, Chester has managed to find his way into the news of late. Apparently, he was acquainted with an Ohio child named Jay Chapman (newspaper reports have termed Gregg Chapman’s “childhood friend”, but Chapman would only have been about 13 at this time: we intend no derogation to intergenerational friendship in saying that this is not the connotation of “childhood friend”). 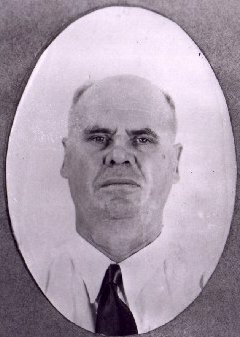 And Chapman would go on, as Oklahoma’s medical examiner in the 1970s, to play a subtle but important role in the modern death penalty: he invented the “traditional” lethal injection three-drug cocktail. But apparently, Chapman assumed that trained medical personnel who knew how to administer IVs and measure drugs would be conducting the procedure. In fact, as executions “medicalized”, professional medical associations like the AMA barred members from participating as a breach of professional ethics. More recently, supply interruptions for lethal drugs have made a mess of the entire process. The upshot has been some high-profile botches — including Ohio itself outright failing in a recent lethal injection attempt — necessitating a 2007–2008 U.S. execution moratorium to sort out legal challenges to the needle. It’s a far cry from Chapman’s vision of a litigation-proof method: “We felt that by going with this type of regimen, no one could suggest that it was cruel and unusual because people undergo this very protocol every day for anesthetic for surgery world-round,” he said in 2009. For that reason, Chapman is quite alright with the switch his home state an others have recently made to conducting lethal injections with only a single massive overdose of a single drug, either sodium thiopental or pentobarbital. Whatever gets the case out of courts, and onto the gurney. As for the ghost of Chester Gregg, he really doesn’t enter the picture either way. * There are some May 2010 photos of Chapman in the Guardian magazine archive. 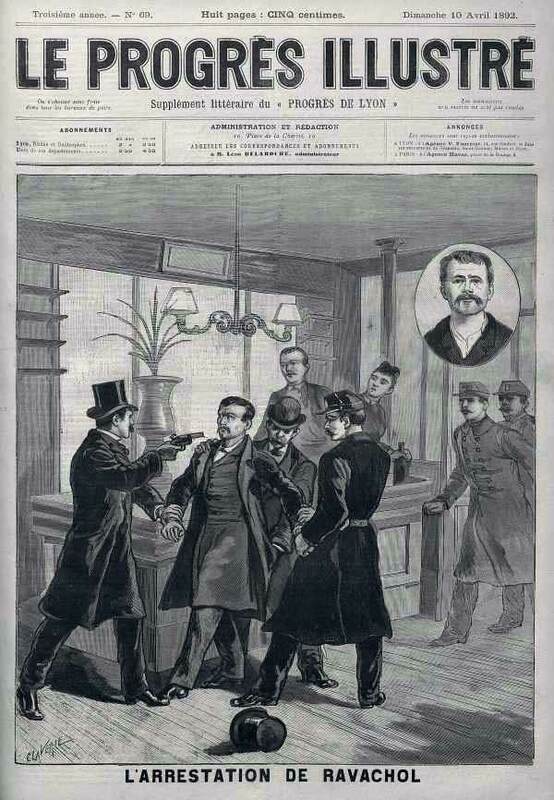 On this date in 1892, French anarchist François Claudius Koenigstein — better known as Ravachol — was guillotined at Montbrison for a series of bomb attacks on right-wing judges. He took the name “Ravachol”, his mother’s, after his Dutch father ditched his mom, leaving the family in poverty. 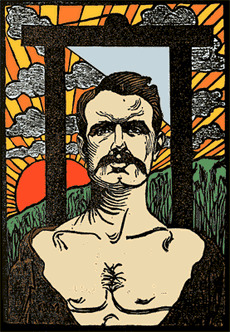 Young Ravachol supported himself as best he could in proletarian labor and crime, as he attempted to observe* at his trial. Ravachol, as painted by Charles Maurin. There are many people who will feel sorry for the victims, but who’ll tell you they can’t do anything about it. Let everyone scrape by as he can! What can he who lacks the necessities when he’s working do when he loses his job? He has only to let himself die of hunger. Then they’ll throw a few pious words on his corpse. This is what I wanted to leave to others. I preferred to make of myself a trafficker in contraband, a counterfeiter, a murderer and assassin. I could have begged, but it’s degrading and cowardly and even punished by your laws, which make poverty a crime. If all those in need, instead of waiting took, wherever and by whatever means, the self-satisfied would understand perhaps a bit more quickly that it’s dangerous to want to consecrate the existing social state, where worry is permanent and life threatened at every moment. Personal want segued into political conviction for Ravachol, whose crimes were justified by the principle of reprise individuelle. 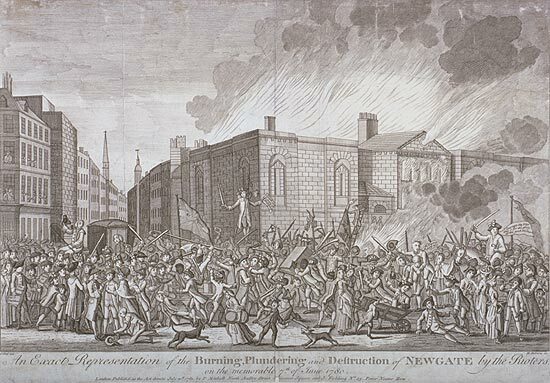 And the political led him to reprisals of a less individual nature, when French state violence against radicals caused him to dynamite several magistrates’ homes. He was caught in a restaurant,** brought to trial, and let off with penal servitude for life. Then another jury, intimidated by public outcry, reversed the decision and sent him to the guillotine. * This incendiary speech was cut off by the court. We had lost confidence in our culture. Everything had to be demolished. We would begin again after the ‘tabula rasa’. At the Cabaret Voltaire we began by shocking common sense, public opinion, education, institutions, museums, good taste, in short, the whole prevailing order. ‡ Ravachol was guillotined midway through a parting exclamation, “Vive la Re-“. Initial newspaper reports implausibly rendered this as the patriotic classic “Vive la Republique!” rather than a much more in-character word like, oh, “Revolution”. Weeks of controversy ensued over some witnesses’ claims that the head post-severing had actually completed the word “-publique”, a notion of a piece with the idea that the severed head survives decapitation by a few seconds. Scienticians countered that obviously excited witnesses were maybe hearing air escaping from the headless trunk and filling in the rest of the scene in their heads.